Zoladex may be looking after my ovaries during chemotherapy, but in so doing, it seems to have waged a rather cruel war on my sleep patterns. Would I trade in my much-loved slumber for a little bundle of joy? Of course I would. But, given that that little bundle of joy is currently sitting it out in the hospital freezer, I think the sleep deprivation is a bit premature! I am pointing the finger firmly at my ovarian suppression implant – designed to send me into a fake early menopause – but I don’t think it is the only culprit. We now have the comfiest bed ever thanks to our wonderful university friends who clubbed together to buy us a mattress. So why do the drugs have to make things so uncomfortable? For anyone wondering what has been going on in our bedroom for the last five nights it is this. First, I dress for bed in a rather fetching outfit made up of a bra (yes I was a bit naked without it, so it’s back), a vest (pink of course), some pyjamas (navy of course), a pair of matching bed socks (complete with pom poms) and a sleep cap. I look pretty coordinated, but I also look like I am prepared for an ice cave rather than a comfy comfy bed. Once in my battle dress, I drift off to sleep without a care in the world, but only for about 45 minutes. Then (and you really could set your clock by it), I am jolted awake by the first of many night sweat/hot flush episodes. It’s like I’m in a spa wandering between the ice cave and the steam room, except there is no attractive ice cave, steam room, soothing music or aromatherapy oils to keep me company. It’s just me – and a whole lot of sweat. Off come the socks, off comes the bed cap and half an hour later I am back in the ice cave searching for the socks and the bed cap once more. Hot then strip then cold. Cold then wrap up then hot. Repeat, sigh, repeat. The bed, once a source of real comfort, now feels like an instrument of torture. Maybe I should be thanking Zoladex for giving me such a wonderful insight into the sleep deprivation that comes with the early days of parenthood. Given there’s no way of knowing whether it’s working, however, I think it’s not something you should be made to endure unless you have a rather lovely reason to get out of bed (retrieving a sleep cap doesn’t really cut it). 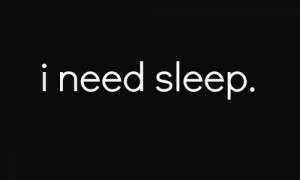 Sleep, if you’re out there, please come back. Whatever I have done to offend you, please let me make amends. Sweet dreams are certainly not make of this.